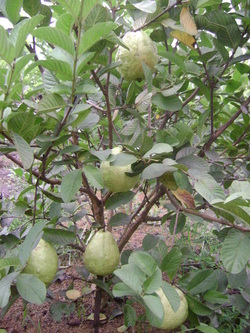 Guapple, a variety of guava (Psidium guajava) is a tropical evergreen shrub to a small tree reaching from 10-15 feet high. This is a supreme variety originated in Florida and has been widely grown in America and some parts of Asia. It was introduced in the Philippines in 1984 from Thailand.